The Canadian Dental Assistants’ Association (CDAA) and the Canadian Dental Association have partnered to develop a survey that examines the factors, realities and experiences of employment as a dental assistant in Canada. All dental assistants in Canada are being invited to participate in the survey. The results will help to inform on the supply of, demand for and the recruitment and retention of dental assistants in Canada. 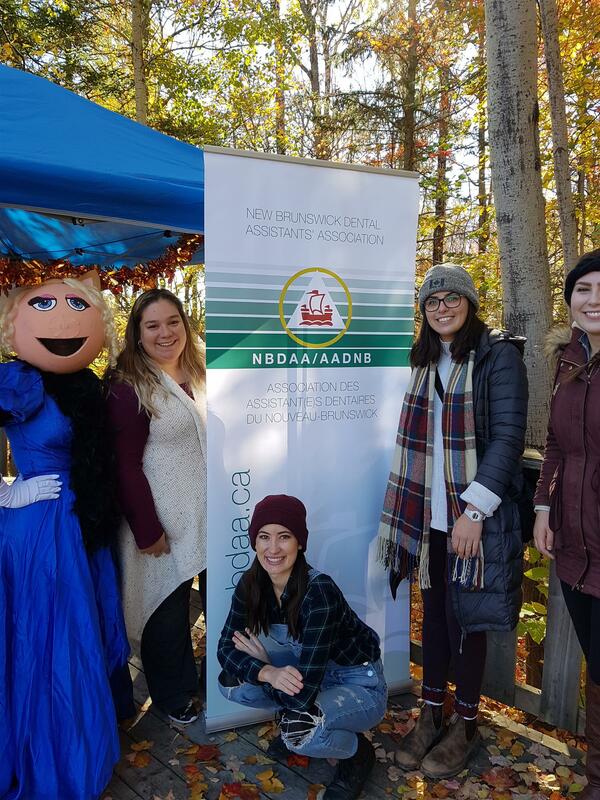 The survey will also assist CDAA in developing resources and materials and will support the development of partnerships with other organizations that can contribute to addressing the needs of dental assistants in Canada. The information you provide through the survey will remain confidential. The data will be summarized and no names or identifying information will be used in any publications or presentations. We recognize that your time is valuable, and we appreciate your participation. Participation in the survey is completely voluntary, but we hope you see the benefit of participating. The survey will take under 10 minutes to complete. We would appreciate it if you could complete the survey before March 30, 2019. 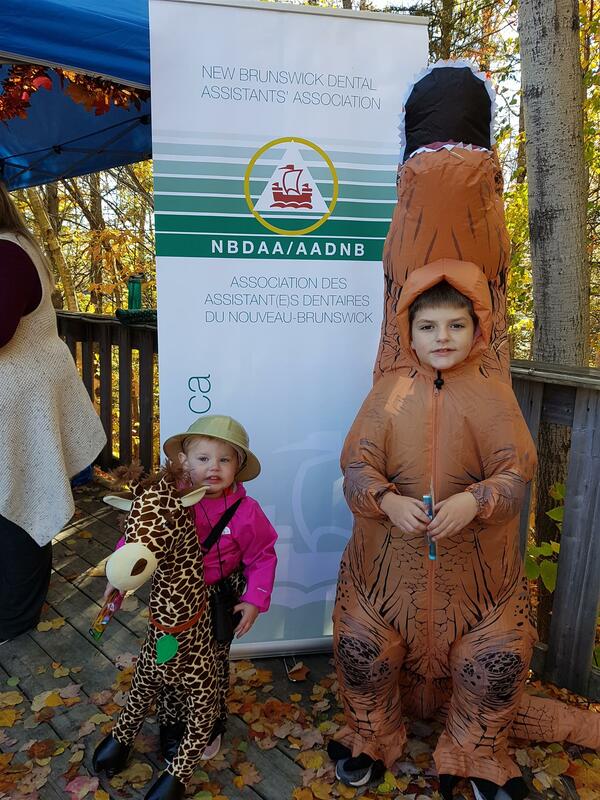 Harry Cummings and Associates (HCA) is conducting a Healthy and Respectful Workplace Survey on behalf of the Canadian Dental Assistants’ Association (CDAA) and the New Brunswick Dental Assisting Association NBDAA. All CDAA members are being invited to participate in the survey. The results will help to inform the development of a vision for a healthy and respectful workplace for CDAA members. The survey will also assist CDAA in developing resources and materials for members and will support the development of partnerships with other organizations that can contribute to the promotion of healthy and respectful workplaces for CDAA members. HCA is an independent consulting firm and the information you provide through the survey will remain confidential. The data will be summarized by HCA, and no names or identifying information will be used in any publications or presentations. All information collected will be maintained by HCA in an electronic file on a password protected encrypted device. HCA adheres to the Tri-Council Policy Statement on Ethical Conduct for Research Involving Humans and the Canadian Evaluation Society Code of Ethics. This survey is conducted in compliance with the Marketing Research and Intelligence Association’s (MRIA) Code of Ethics. We recognize that your time is valuable, and we appreciate your participation. In recognition of your time, people who complete the survey can choose to be entered into a draw for a great prize. Please note that some of the questions in the survey will address your current and past experience with harassment, bullying, abuse and/or violence in the workplace. The survey will also touch on your experience around issues of management and leadership in the workplace. If any of the questions in the survey make you feel uncomfortable, please feel free to skip the question. We hope that you are able to respond to all or most of the questions as this will strengthen our ability to identify common themes and trends when analyzing the data. If you feel the need to discuss issues of workplace harassment / bullying / abuse / violence and there are no satisfactory options available at your workplace, we suggest that you reach out to your provincial association, provincial college or the CDAA. The survey will take about 15-20 minutes to complete. We would appreciate it if you could complete the survey before December 10, 2018. Details of the Fall Con-Ed will be with your membership renewals to be mailed on August 27th, 2018. Stay tuned. 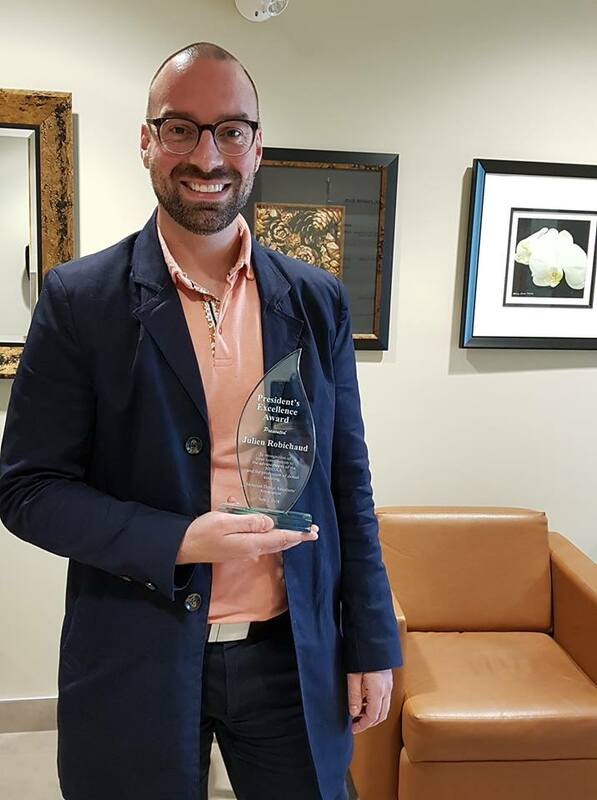 President's Excellence Award: Julien Robichaud our current CDAA representative. 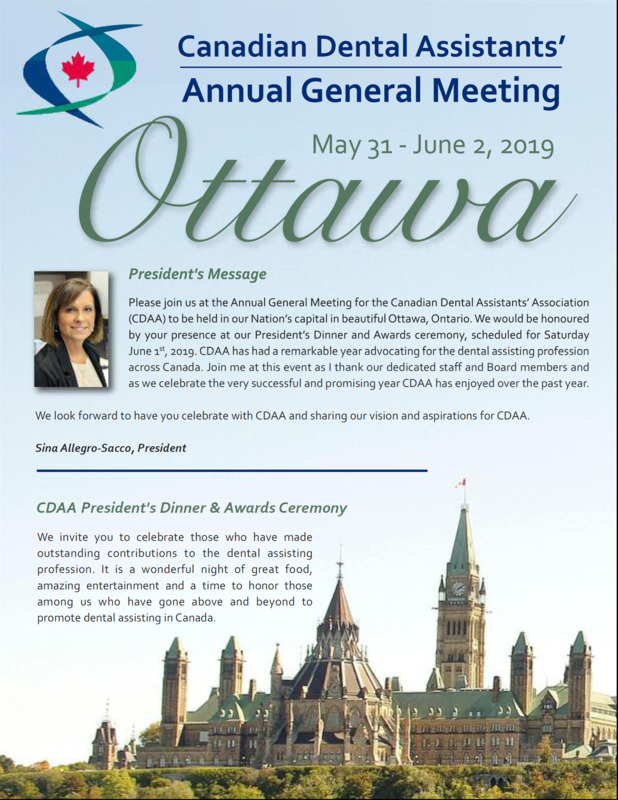 Julien will finish is 2-year term at the end of the month following the CDAA AGM in Gatineau QC. Thank you Julien for your dedication to our provincial association!!! 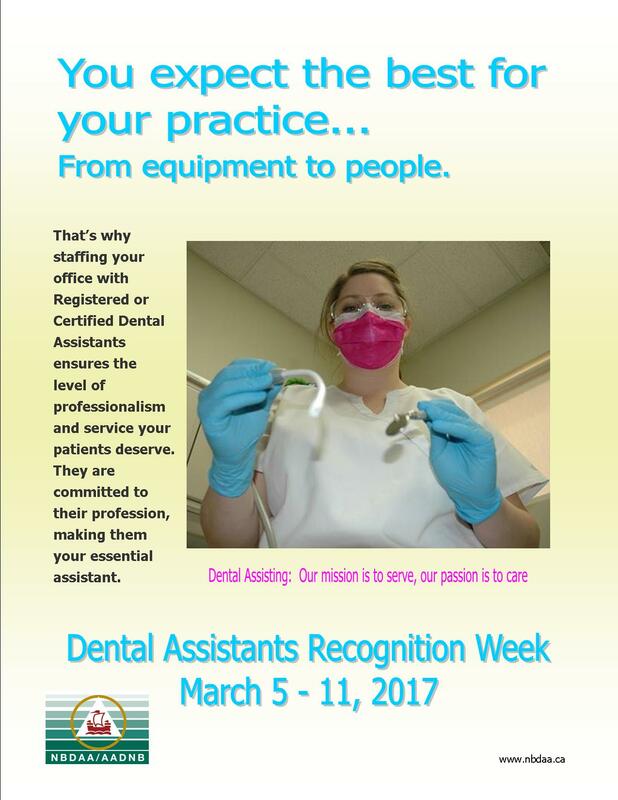 One dental assistant from each local will receive a gift in honour of the Dental Assistants Recognition Week from NBDAA. ​Congratulations and have a terrific week!!! 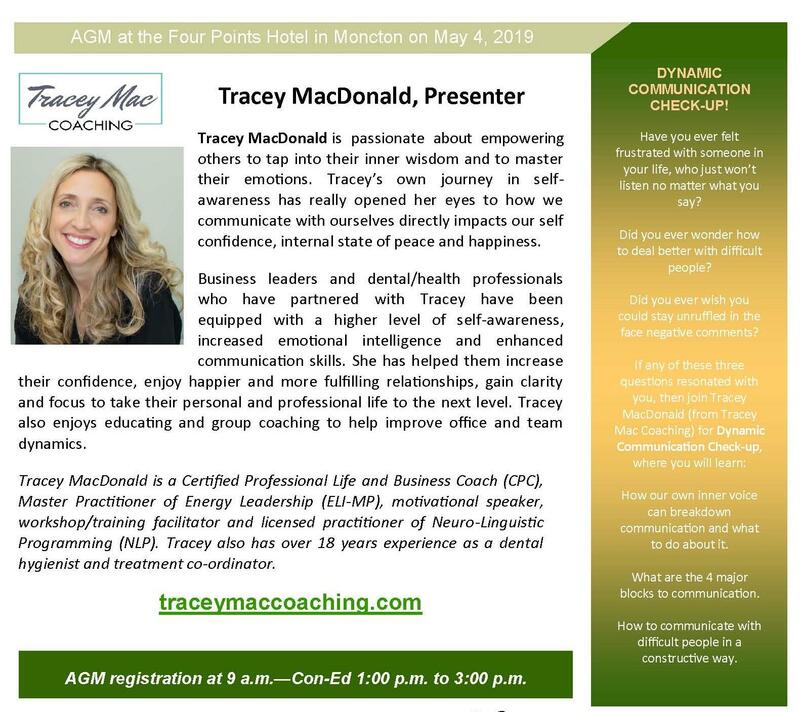 The volunteering on April 10 - Moncton local. We turned out to be a small group but we still had fun. 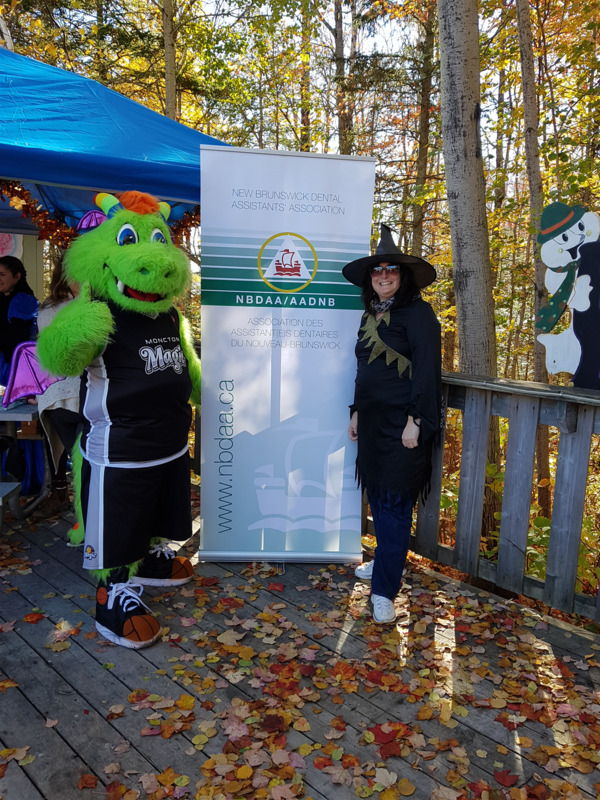 We made cupcakes and brownies and the Shediac Dental Clinic donated children's toothbrushes and mouth wash. It's national volunteer week and I would like to thank our board members for the great team work! C'est la semaine de l'action bénévole et j'aimerais dire merci à notre conseil d'administration pour leur travail exceptionnel! 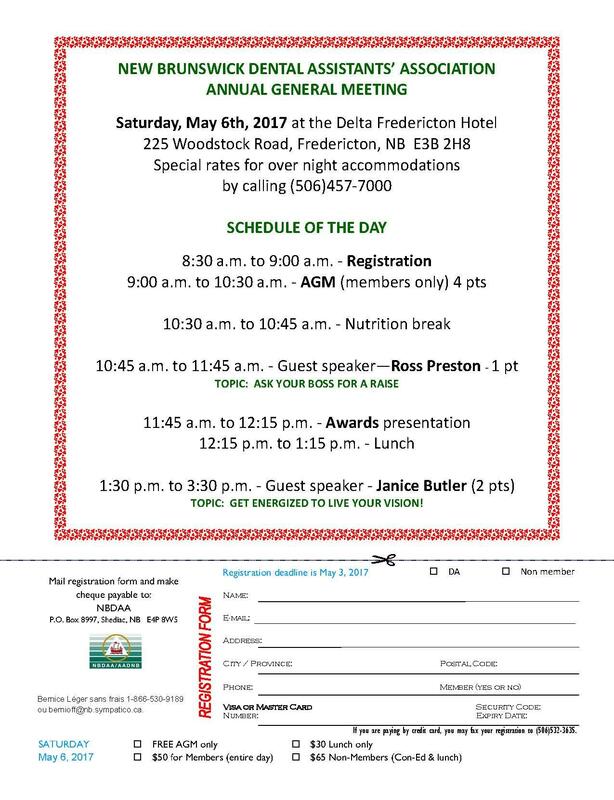 Here is the schedule for the 2017 AGM in Fredericton. Printable version here. 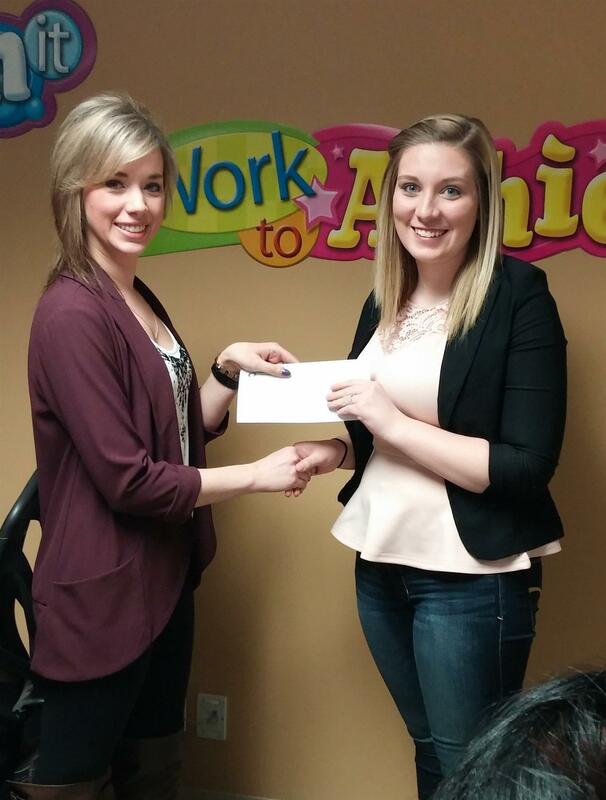 This year's scholarship recipients are Amélie Ringuette of the CCNB Campbellton and Stéphanie Pitre of Oulton College. 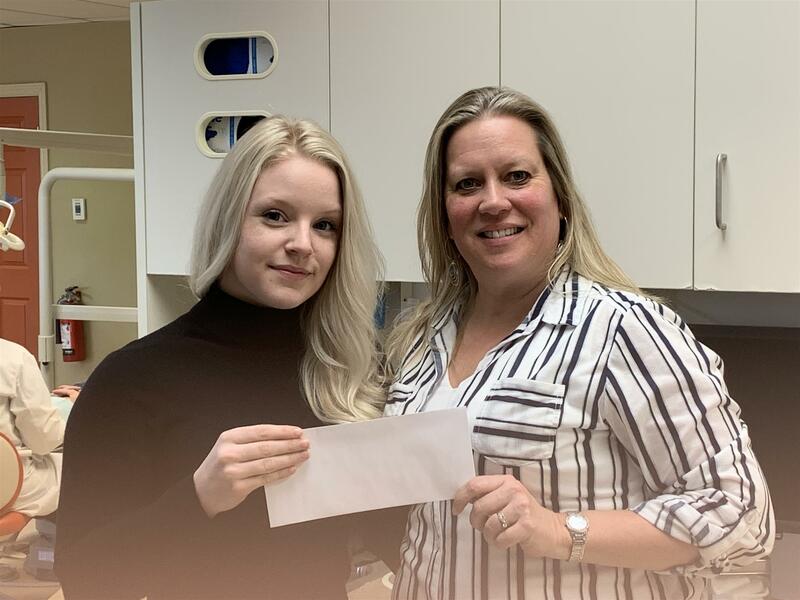 Below, in the photo, Amélie Ringuette receiving her scholarship from her teacher, Joanne Haché of the Dental Assisting program at the CCNB-Campbellton. The winner of the photo contest is Jean-Marie Christensen. 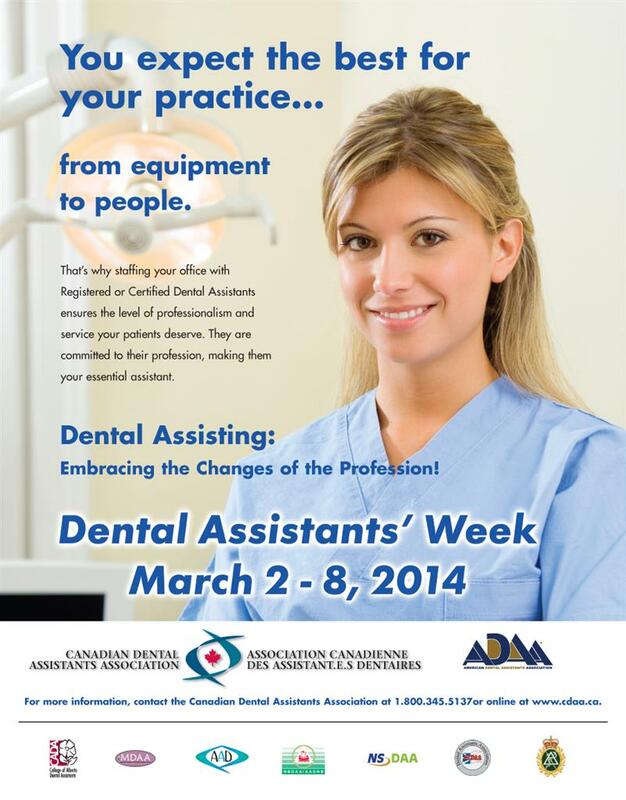 Help us celebrate the Dental Assistants recognition week. Print the poster and display it where everyone can see it. 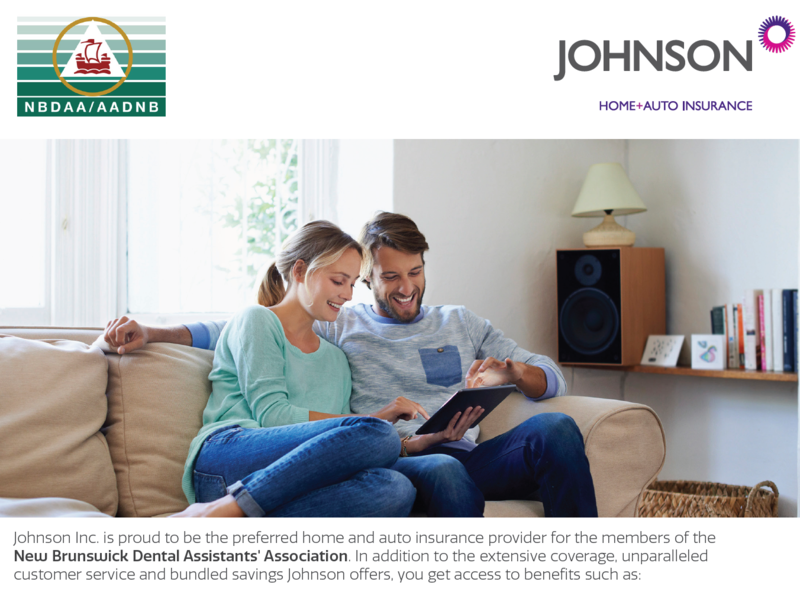 I’m excited to tell you about a contest we at Johnson Insurance are currently running that may be of interest to your members in the Atlantic region. 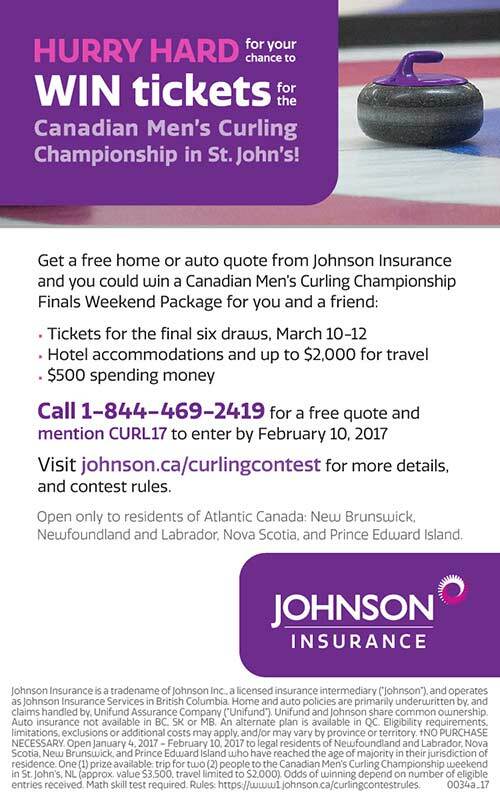 Right now, when your members call for a free, no-obligation home or auto insurance quote, they can enter for a chance to win a weekend in St. John’s, Newfoundland to attend the Canadian Men’s Curling Championship finals—simply by mentioning CURL17. The registered continuing education points for 2015-2016 have been updated. See downloads. Membership renewals will be mailed on August 23, 2016. It's time to make sure you have ALL your 12 continuing education points. Enjoy the summer!!! 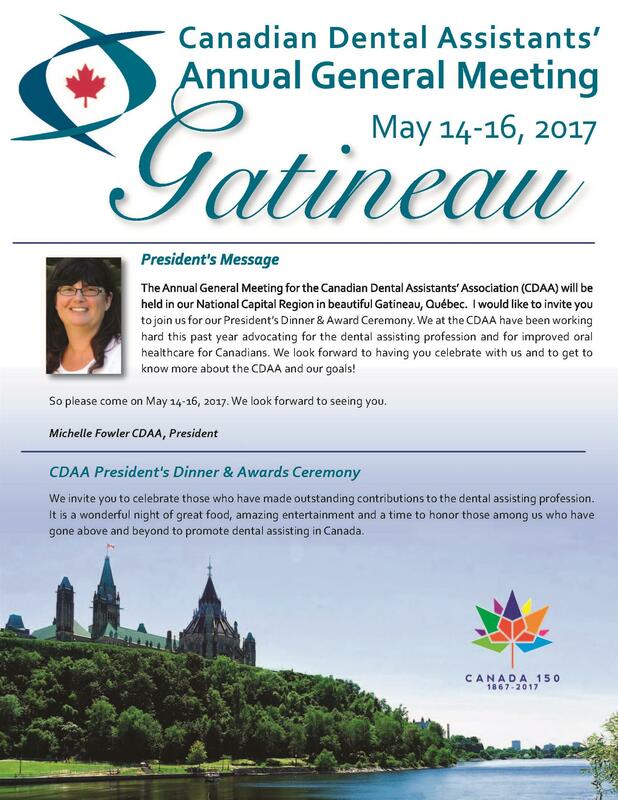 CDAA is pleased to announce that the Annual General Meeting will be held in Gatineau, Québec June 10-12, 2016 at the Ramada Plaza, Le Manor Casino Hotel. The invitation and registration form for the CDAA President’s Dinner and Annual Awards Ceremony, Saturday, June 11th, 2016. Deadline for registration and payment to the CDAA President’s Dinner and Awards Ceremony is May 5th, 2016. Should you like, you may reserve your room at the Ramada Plaza, Le Manor Casino Hotel by quoting our reservation # CGB302. Please note the deadline to book your room at the preferred rate is May 5th, 2016. 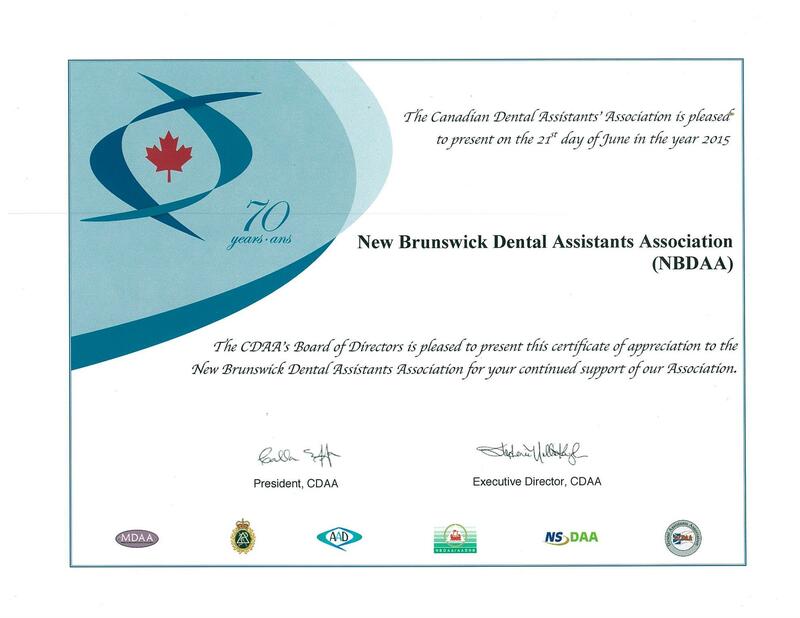 In 2016 the Dental Assistants' Association of New Brunswick created two $500 scholarships for a dental assisting student from N.-B. 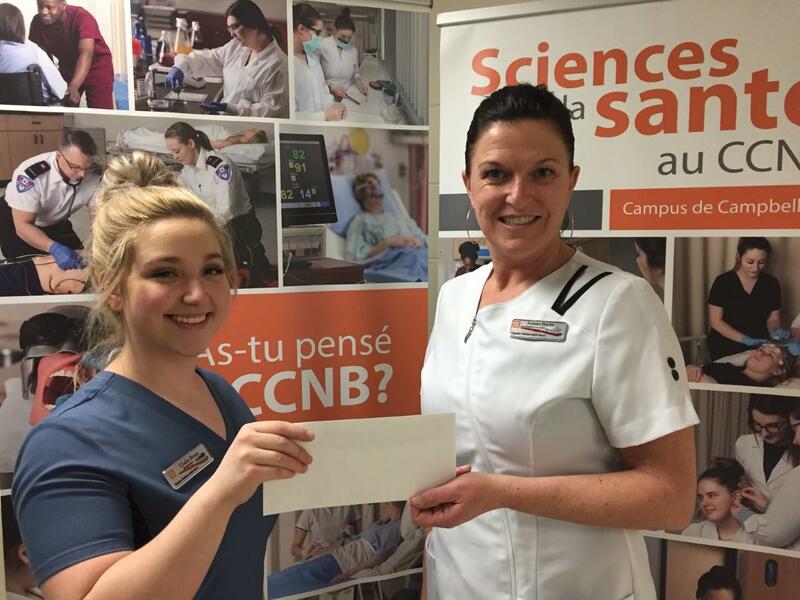 A second scholarship has been awarded to Bianka Madore studying Dental Assisting at the CCNB Campbellton presented by the President, Marie-Christine Arseneau (left). 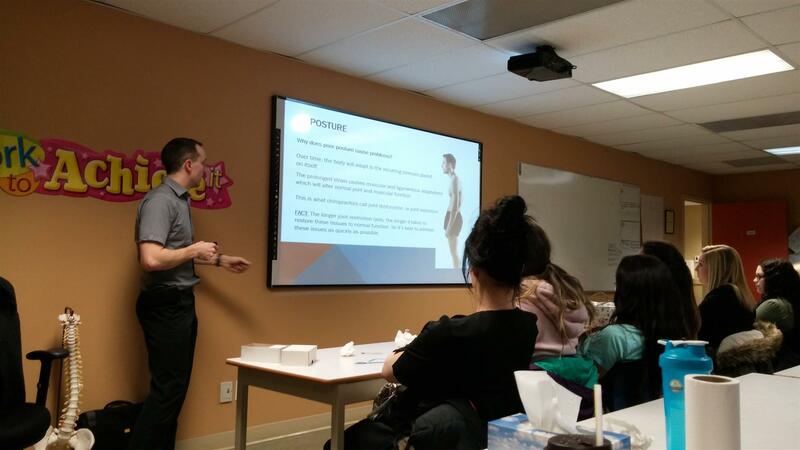 Dr. Mathieu Hebert gave an excellent presentation on chiropractics with 43 DA's in attendance! We would like to welcome our two latest provincial board members, Sylvie Fortin-Bourque, the North Shore local representative and Alyssa Eccleston, Moncton local representative. Welcome aboard! Tuesday night we had our monthly meeting at the Rothesay Ave Super Store. 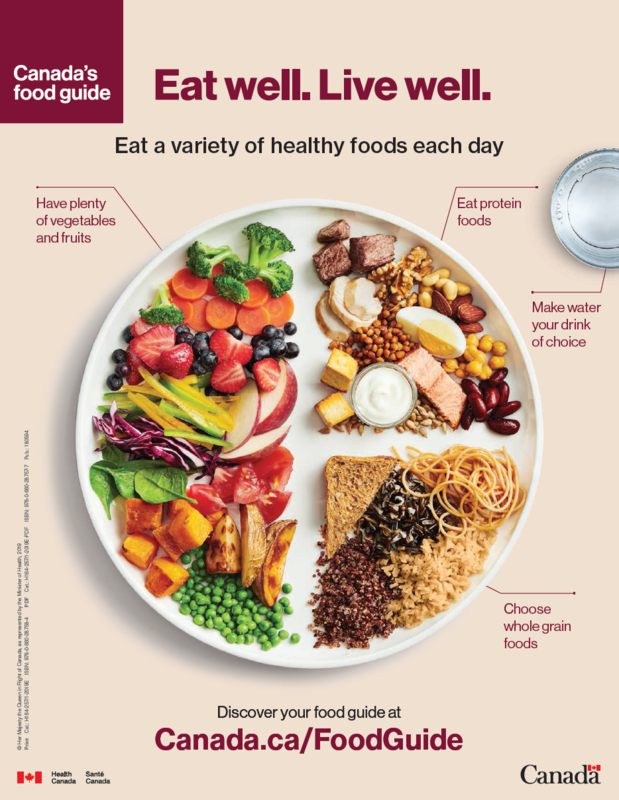 Our Guest Speaker was Vanessa Yurchesyn, a Dietitian who works for Loblaw. She went over lots of very interesting facts about nutrition and what's healthy and what isn't. 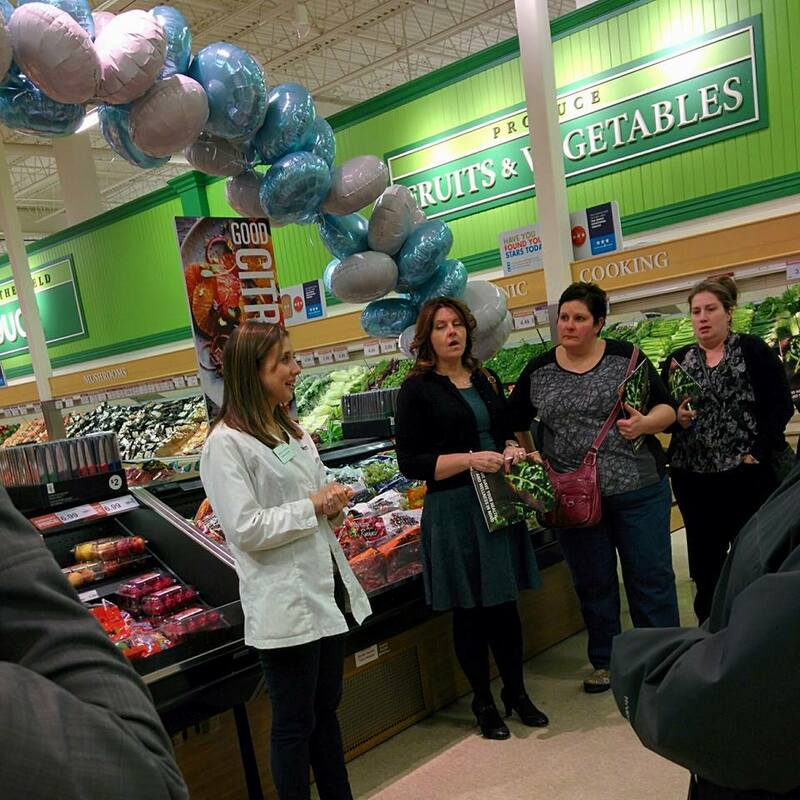 We were taken on a tour around the store and shown healthier options. At the end of the tour Vanessa invited us back to do a cooking class, which we will be considering for a meeting in 2017. She also told us that if anyone is interested in returning for a more one on one nutritional consultation and tour of the store, that it is free and anyone is welcome. Vanessa can be contacted via email or phone. Her information is below for anyone that is interested. 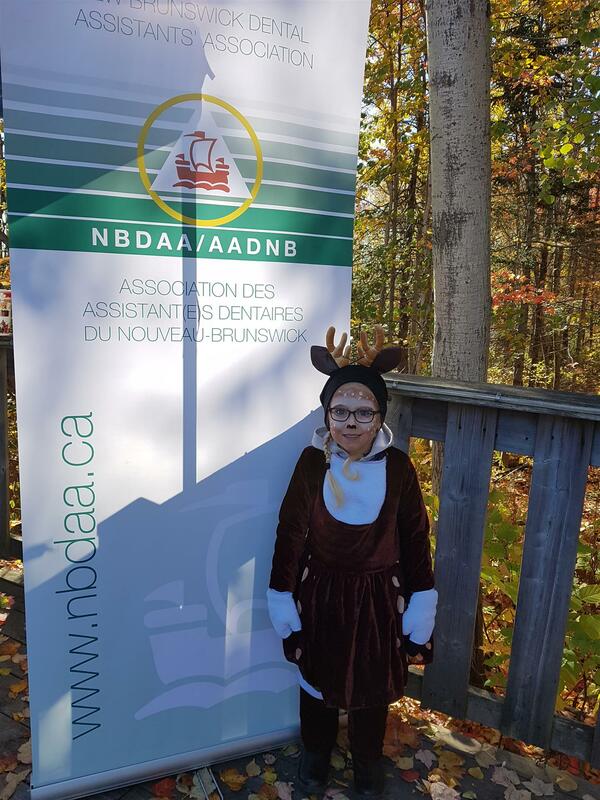 Another topic discussed at the meeting was "Smiles for Canada"
Smiles 4 Canada is a program run by the Canadian Foundation for the Advancement of Orthodontics (CFAO) in conjunction with the Canadian Association of Orthodontists (CAO). 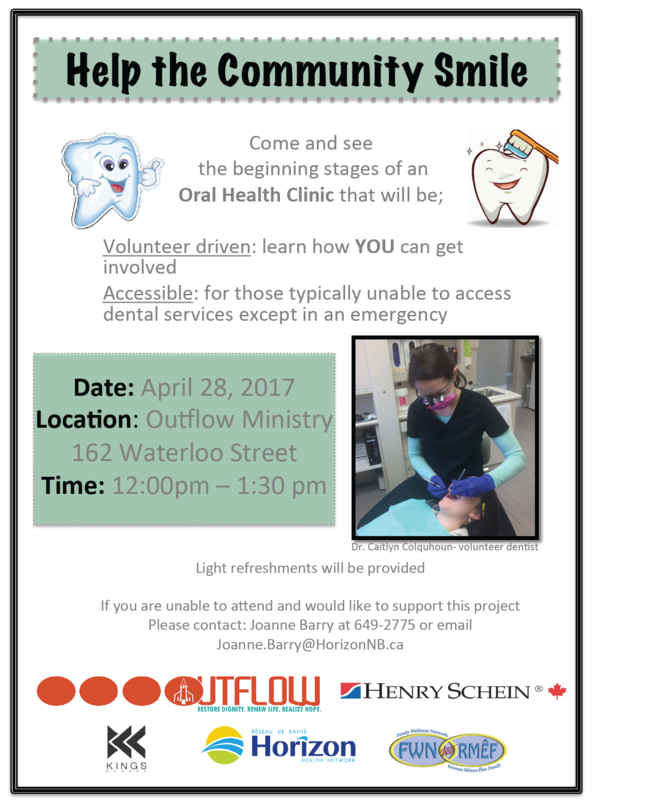 The program facilitates the orthodontic treatment of deserving young Canadians who would otherwise not be able to afford treatment. Applicants to the program must be under 14 years old. Patients who are accepted for treatment through the program will be treated by a local participating orthodontist. Patients’ families are only required to pay a small administrative fee, generally less than 10% of a complete course of treatment. 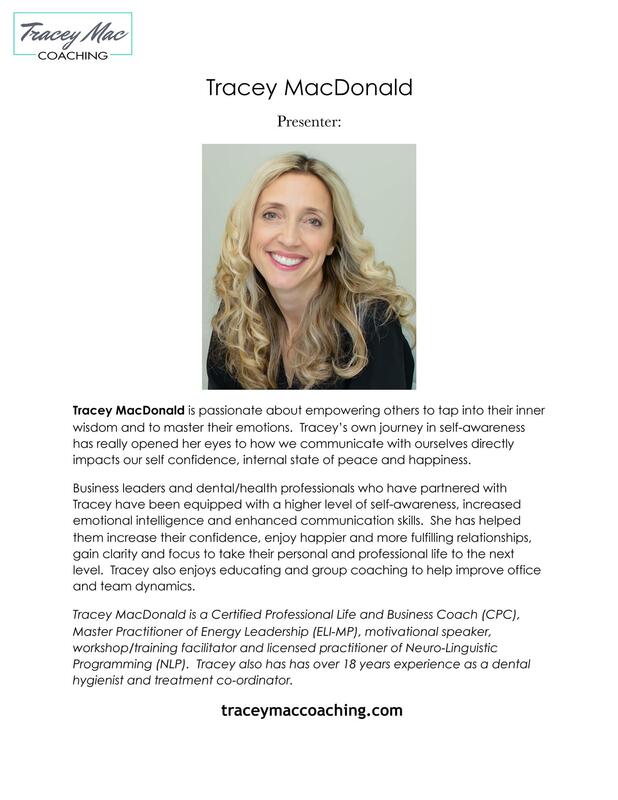 ** This program was brought to our attention from an orthodontic assistant of this program for underprivileged children. Please pass this along to your Dentist. Hope to see you all at the next meeting which will be February 3rd, our guest speaker will be Dr. Fitzpatrick and he will be talking to us about Cleft Palate. We are hoping to have the meeting at the Rothesay Ave Super store again. We will send out an email when the location is confirmed. 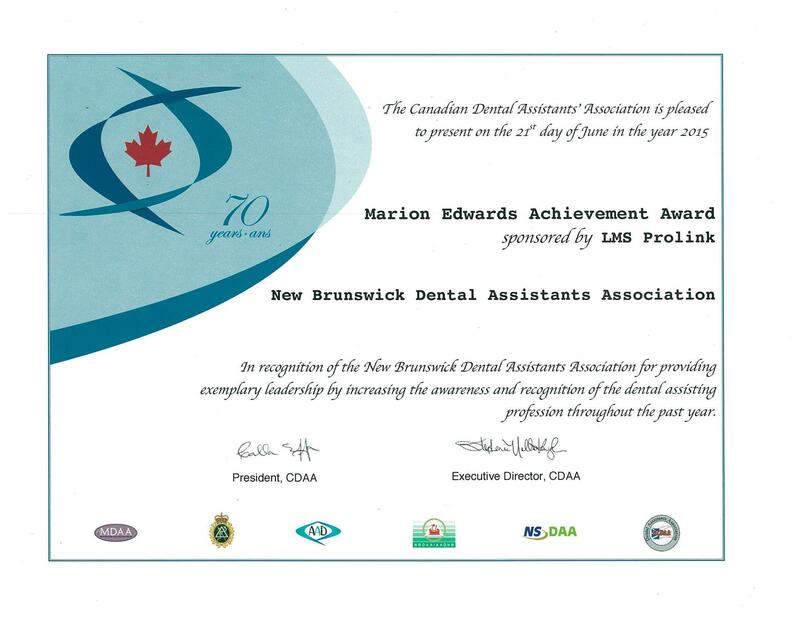 I would like to remind all level II dental assistants that license renewals must be received by the New Brunswick Dental Society on or before January 31st. Ceci est un rappel que les renouvellements de permis pour les aides-dentaires niveau II sont dues au bureau de la Société dentaire du Nouveau-Brunswick au plus tard le 31 janvier. To enter the photo contest, visit https://www.facebook.com/Photo-contest-849361051848415/, click on the Photo Contest tab and submit your photo. Only entries submitted through this method will be considered valid. Contestants are limited to entering one photo per day. The contest closes on February 10, 2016. No late entries will be accepted. The contest is open to NBDAA members only. Photos must represent the profession of dental assisting. The winners of the contest will be selected from the top 10 with the most likes. The contest committee will select the top 3 photos and announce the winners on February 13, 2016. Prizes will be awarded. No purchase, expenditure or investment is necessary to enter this contest. 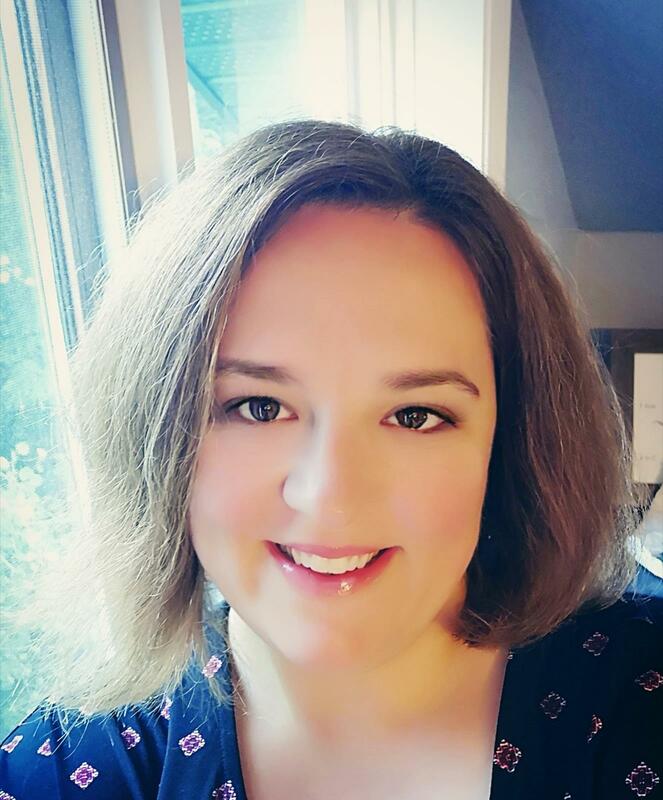 The moderators of the contest reserve the right to not accept photos that may be offensive to the public or that demonstrate unsafe practices or unethical. The winners agree to have NBDAA use the photos in promotional materials such as posters, brochures, newsletters, etc. Did you know, the NBDAA received 2 awards during the CDAA AGM in June 2015. 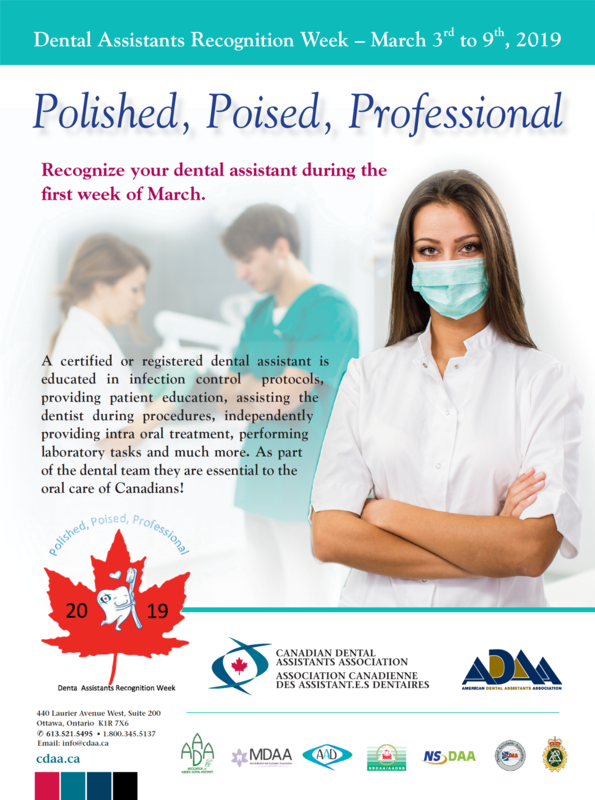 The Canadian Dental Assistants’ Association in collaboration with the Pan-Canadian Health Human Resources Network would like to invite dental assistants to participate in the final stages of the Building Capacity in Dental Assisting Research (BCDAR) project. The concluding phase of the BCDAR project will consist of several one-on-one semi-structured telephone interviews with practicing dental assistants. The primary goal of these interviews is cultivate upstream knowledge. That is, to look to dental assistants for expertise in this field and contribute to current discussion in occupational health. As such, interview questions will focus on occupational health concerns in dental assisting and allow for significant discussion on behalf of the participants. If you are selected as a research participant you will be contacted via e-mail to coordinate a telephone interview. You may now register for the 2015 Fredericton Symposium scheduled for October 17th, 2015 at the Hugh John Flemming Forestry Complex. 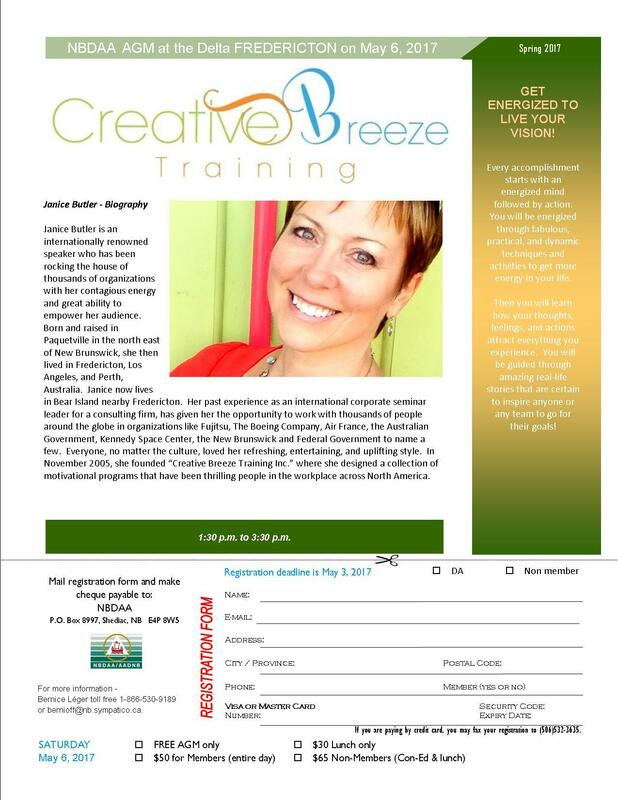 Registration deadline is October 14, 2015. Share with your dental team. Yes, the time has come! As of June 1, 2015 - The membership fee will increase from $100 to $135 per year. This increase will include the malpractice insurance for ALL regular members. The Super 8 in Moncton-Dieppe has been sold. 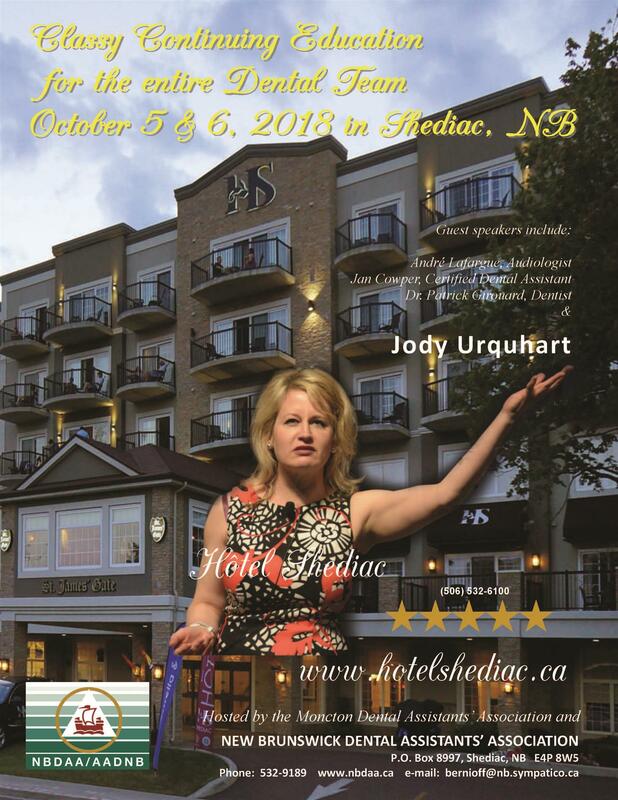 The Dental Assistants no longer have the discount at any Super 8 hotels in New Brunswick. As part of the consultations undertaken, CDAA heard that it needs to move concretely towards a federated model and away from a member-focused model. To that end, CDAA has undertaken a down-tooling of its continuing education program to better reflect its newly-focused direction, while continuing to pursue opportunities to recognize the profession from a national perspective. The CDAA Continuing Education program will be taken offline and no longer offered as of April 1, 2015, this means that no CDAA online courses will be available to dental assistants beyond March 31, 2015 and all previously paid/registered courses must be completed and certificates issued/printed no later than March 31, 2015. We understand that this change may cause apprehension for members who use our continuing education services. We will be pleased to address any concerns/questions you may have and ask that they contact the CDAA office, toll-free at 1-800-345-5137, Tuesday through Thursday, 8:30 a.m. to 4:30 p.m. EST. Over the coming weeks, CDAA will also post a Frequently Asked Questions section on our website, (www.cdaa.ca), to further support the students through this transition. Try Pet Insurance for 8 weeks! For many Canadian students, the jump from high school to post-secondary education signals a thrilling transition into adulthood. Along with the excitement and independence, however, come new responsibilities like paying for tuition, textbooks and basic daily essentials. At Johnson, we understand the challenges faced by students during their pursuit of higher education, and we are proud to offer scholarships to help them achieve their dreams. Since 1998, Johnson has awarded over 1500 scholarships valued at more than $1 million to support young Canadians coast to coast in pursuing their post-secondary education. This year, we are pleased to offer 50 scholarships worth $1000 each to children and grandchildren of Johnson’s affinity group members and home and auto insurance clients. Students must have completed high school in 2014 and beginning post-secondary education this fall. Applications for the Scholarship Program will be accepted as of July 1, 2014. Completed application forms must be submitted by October 15, 2014 and must contain an official school transcript of final year credits. For more information, or to apply for a Johnson Inc. scholarship, please visit our scholarships page at www.johnson.ca or call 1.866.544.2673. 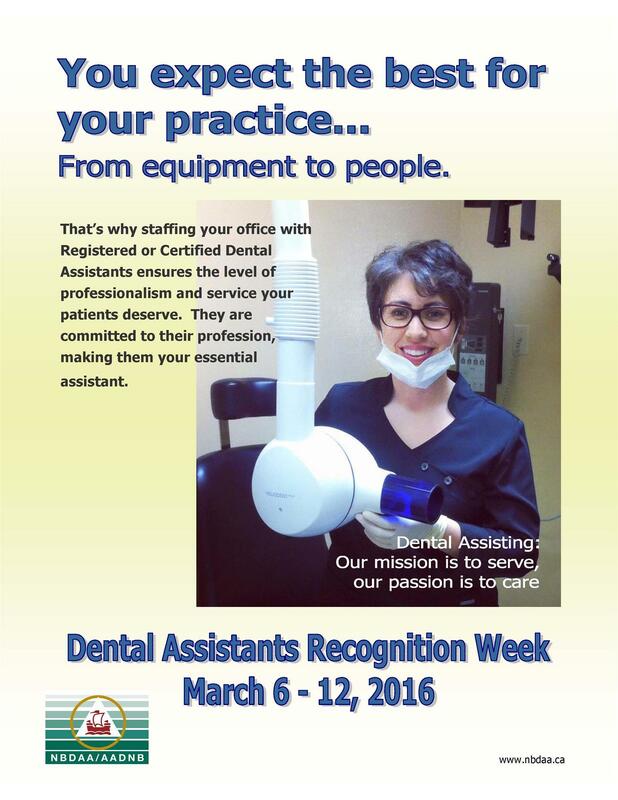 One dental assistant from each local will receive a gift in honour of the Dental Assistants Recognition Week. Come visit the website each day to find out who are the lucky recipients. We just wanted to touch base and let you in on some of our plans for the fall. All of us are really excited to get started and hopefully see our attendance and attitudes improve! We have decided (with the exception of a couple of months) our meetings will be the first Wednesday of the month at 6:30. 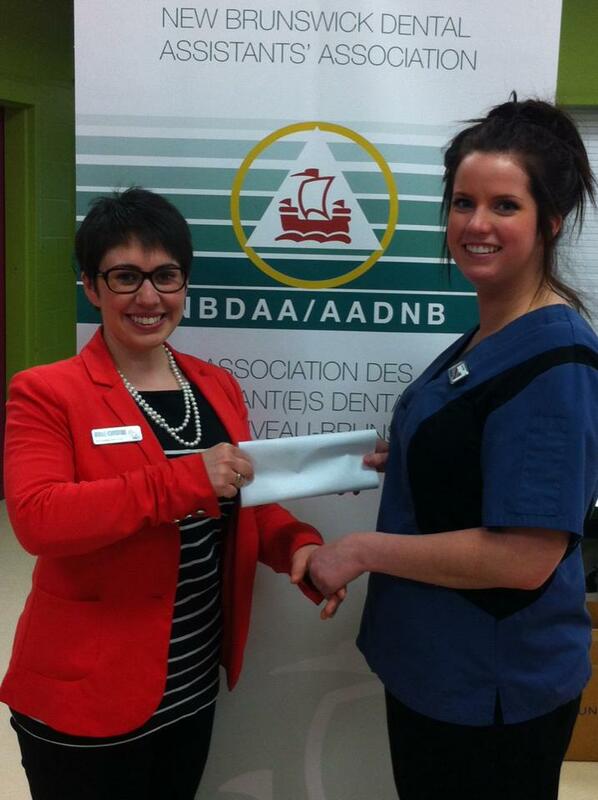 We are very pleased that the Dental Assistants College of Saint John has agreed to provide the venue for our meetings. The list of tentative dates for our meetings is posted under events. We will have a guest speaker at 4 of the meetings. The file for the continuing education points has been updated on August 2, 2013. Those are the points provided to NBDAA and if you have more points, you will need to provide proof along with your membership renewal which will be mailed on August 23, 2013. For new graduates requiring a regular membership to obtain a license, please use the "Membership application" under download. Don't forget to enclose a copy of your dental assisting diploma, National Certificate and CPE if applicable.